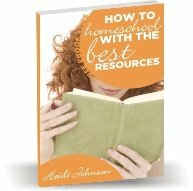 Homeschool Forms and Worksheets to Simplify Your Day! Here are some homeschool forms you can use that will help simplify your day. I'll be adding more forms here as I get them made. Using schedules and charts can help your day run smoother. Why try to reinvent the wheel when someone has already made something simple to fill out? Let me know if you're looking for a specific form and I'll see what I can do. On the homeschool schedule - this form helps a parent know what their child accomplished in a given week. The parent fills in the left side of the form with the subject and the student fills in what they accomplished. Another way to use this form is to have the parent fill out everything that they feel the student needs to complete in a week. Then the child can check off those items that have been completed. I prefer for my children to give some detail of what they did instead of just checking it off i.e. how long did you practice your instrument, how many chapters did you read, etc. Chore Chart (directions on the last page) and a Chore Card I like even better! I have used the chore card several times with different children to help them develop the habit of doing a chore. Once they do the chore 10 times without complaining, they get a treat like a trip to the ice cream place, some special time with a parent, or something else that doesn't cost a lot that the child will like. I don't make it a habit of rewarding my children for every chore that they do. In a home, everyone needs to work a bit to make things run smoothly. I only use this form to set a chore in place. 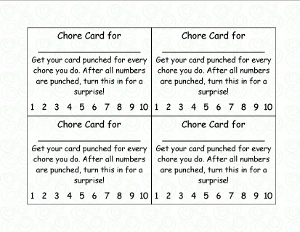 Hopefully with 1 or 2 chore cards filled out, the student will not need to be rewarded each time they do the task. Another thing to mention, if the student did not do the chore the first time they were told with a good attitude, they still had to do the chore but did not get to have their card punched. Once your students get close to high school, you'll want to use some homeschool forms and start thinking about keeping track of their classes especially if they are thinking about going to college. When you have a simple form to follow, it's easy to fill in the classes and information. Be sure to check your state requirements for graduation so you can plan what classes your student needs to take. Here are some forms and advice that will help you along the way. I hope these homeschool forms have been helpful to you. Let me know if you have an idea of a form you'd like to see and I will create one for you.